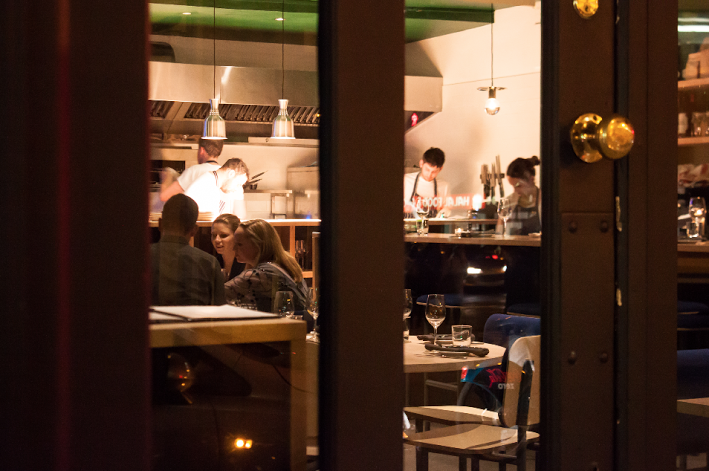 Bastible is a contemporary neighborhood bistro stationed on Leonard’s Corner in the heart of Dublin 8. Our food is based on the seasons around us, sourced from dedicated artisan producers, and inspired by the creativity of our small team. From Wednesday to Saturday we offer our set menu which changes regularly. On Sundays we select larger joints of meat or fish for our family-style lunch. The wine list has some left field varieties alongside plenty of more familiar choices, with a range of options to enjoy by the glass. Reservations are welcome and we do our utmost to accommodate walk-ins as best we can. There are a number of great pubs in the area for a pre or post-prandial drink. Superb in every way.......as always! Outstanding food, great service and an experience that I hope to repeat again soon. It was a very enjoyable dining experience,delicious food in which their was time given between courses to absorb the many combination of flavours .An exceptional experience and value for money.Will definitely return. Phenomenal food in a very comfortable setting. Couldn't recommend any higher! Sunday lunch is to my knowledge the best value meal in Dublin. Really liked the playlist. Perfect for a Sunday afternoon. It would be nice if you had a beer licence. I drink non-alcoholic beer and one of the party drinks only beer. The service was absolutely excellent - our server/s couldn't have been more accommodating and gracious and with a smile. We didn't go to Bastible expecting "value for money" but what we got was a delicious meal that wasn't cheap in any respect. Nothing was spared on ingredients and service. We thoroughly enjoyed the experience - will definitely be back and will certainly be recommending Bastible to others. It was great. Thank you. Had a really enjoyable time at Bastible. The food was amazing and the service was extremely thoughtful. I look forward to returning soon! Exciting and pleasurable dining experience. They really understand food. Amazing food, great service, very attentive and helpful, highly recommended! Great meal. Really enjoyed it. I thoroughly enjoyed my experience at Bastible, it certainly lived up to the hype. I will definitely return again. Excellent food, this is one of the top restaurants in Dublin at the moment without question. Our waitress was lovely. The place was buzzing and extremely busy but it didnt phase her. The food is absolutely outstanding. I would highly recommend. Fantastic place for a small celebration. We were a table of 8 and the service was to perfection and very attentive - they really went above and beyond. We were recommended to try the Chef's Tasting Menu and it was spectacular! Everyone was so pleasantly surprised with the variety, high quality ingredients and innovative touch on traditional dishes. Would definitely recommend! Fantastic meal, cooked superbly. We will be recommending Bastible to our friends. The Sunday lunch was fantastic! Great variety of tastes for starters. Beautiful beef for main. Wonderful night: great food and excellent service! Well worth waiting for the reservation. Great meal, chef table a good option, excellent service, exciting time for Irish cuisine. This restaurant is very impressive. Beautiful flavourful food, particularly the confit chicken snack and the lamb shoulder starter. Quite slow though, we were waiting quite a while for each course. Worst thing was the coffee used for the espresso martini. It had that weird flavour that some places have - very hard to put my finger on but I describe it as baked beans-y. It's the reason I don't like Fumbally cafe. Nasty stuff. First time visit and very pleasantly surprised, higher quality of food than I was expecting, delicious combination of flavours in both my starter and main, the quality of ingredients was immediately apparent. Delicious and beautifully presented. Also v accommodating when we needed to amend our booking to later start time, much appreciated. Def recommend and will be back with my foodie friends.